King Street now Watergate Street was an ancient Deptford thoroughfare giving main access to the river. In the 17th and 18th centuries many of those inhabitants connected with its maritime industries, lived here in good houses such as this one No.17. (watercolour illustration by J.R. Llwyd Roberts.) 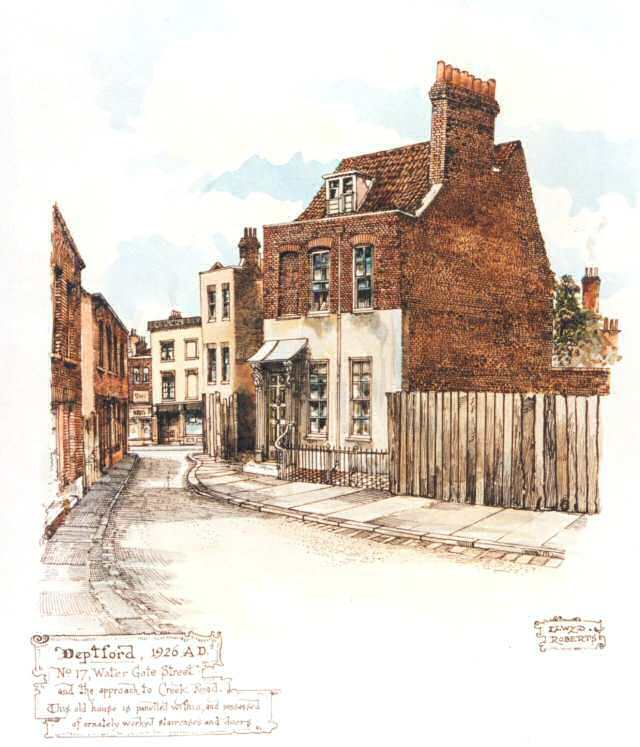 It is similar to the surviving houses built in Albury Street by Thomas Lucas who also carried out building works in the adjacent Royal Dockyard from 1707. It was originally a part of a nearly continuous terrace of dwelling houses from the High Street (Deptford High St) to the Thames. 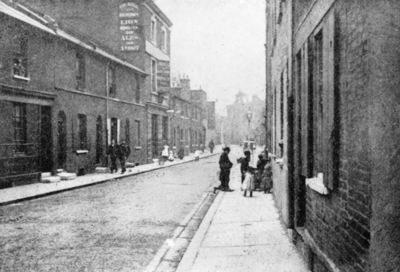 In the mid 1920's the street had become a slum, and many of the houses had decaded and been demolished. Regeneration and new housing have now replaced those of the old street. Watergate Steps leading down to the Thames. Many thanks for the information about your family history. I will be posting some more pictures and information on the area of Deptford Green very soon. Thank you for your kind comments on the website. 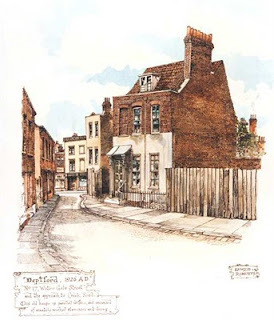 It's great to hear you are writing a story about 18th century Deptford and in particular Albury street. Some street names were different in the 18th century. Albury St was called Union Street up to the late 1890's when it changed. Here are some street names that were about during the 18c but some have also been changed. Collier St and Wellington St (Flagons Row) were the next streets north and the same side as Union St. They were demolished when Evelyn St and Creek Road were joined up. Heading South you had Hyde Street, still named the same today along with Hamilton St. Mary Anne Gardens and Crossfield Lane are also the same. Near the Deptford Market were Giffin St, Regent St, Stanhope St, Hales St, Pleasent Row which was a line of houses on the left by Douglas St all now shops. There was also Charles St, Reginal Road and Wilcox Place. I hope this is enough to help you. Please keep me informed on how your story goes and I will help anyway I can. Anon, thank you for your kind comment. Czar St, near Sayes Court. I will try and find some photos. The reference is 0.75 I think. The box contains several early photographs, of Watergate Street, Flagon Row, some show people outside the houses too. If you take your own camera to the archive you can photograph the images yourself. Good luck. Was wondering if you had any info or pictures of hyde street around the late 1890 early 1900, only asking because my grandad was born there, so would be very intersting to see, also at the time of my grandad's birth his father was a slaughterman, is this something that would of been popular in that area around those times. Interesting..My grandad James White lived 24 Hyde Street from approx 1910 onwards and then at 29 Albury St when he married Clara Elizabeth Diggens whos father Alfred George Diggens was a also a slaughterman. They lived at 156 Watergate St, then onto 29 Albury Street where they all lived together. Is there a connection? His surname was White. Hi I'm interested in Butchers Row Deptford, just found out my Gt grand mother was born there. Her parents were from Ireland, did the area have an Irish community? Have you tried this web site link? Hi, my husband's great Grandfather was hit over the head with a bottle in deptford 19/02/1923 - would you have any clue how I could research anywhere to find out more about it? Walter Clark is the man in question who lived nearby in The Stowage. I am researching my family Tree and have found that they originate in Deptford Kent. The Family name is Carter and my 2nd Great Grandfather was named James and he was born at 5 Finsbury Street, St Paul,Deptford, Greenwich. Parents Joseph and Ann. He went on to marry Annie M Vincent also from Deptford. I am having great difficulties locating Joseph and family between 1831 and 1851? There are older siblings there born in 5 New Street, St Nicholas, Deptford, but as I said I can find no trace on the 1841 or 1851 Census? Also I am not sure if Joseph was the first Carter to settle in Deptford. Any help you could give would be greatly appreciated. Grant Carter, Sydney Australia. Gibson House: I am looking for information about why the architecture of Gibson House is like it is. Does anyone know whom I can contact, offline, with information about: original conception, leading figures (builders etc), history of occupation, current owners/managers etc. I am trying to find information about THE STOWAGE.circa 1920. My father was born there to Joseph and Susan Bracey. I have vague memories of the houses. Does anyone have a photo? Hello, I'm researching the life and career of an old 18th and 19th Century sailor (JOSEPH CLARK)who was from Deptford (Flaggon Row)and who, as a young boy, joined the crew of HMS BLANCHE in Deptford in 1792. He had an incredible career in the Royal Navy which later included fighting at The Battle of Trafalgar (HMS MINOTAUR. )In 1841 Joseph Clark is seen living with his wife Hanna at 20 King Street(1841 census), and he's also seen (finally) on the 1851 census described as "Boat Swain Pensioner" I am trying to establish (a) His address in Flaggon Row in the early 1790's (b) The relationship of a woman named as "Bridgette Woolford", also of Flaggon Row, named in his Royal Navy Will as Next of Kin, and (c)his later employment in Deptford (d) on what date Joseph Clark (and or his wife)died and where he/she was buried. Also if his death (as a local 'Hero of Trafalgar") was maybe covered in the 1851+ period by a local newspaper ? Any help from keen Deptford historians will be greatly appreciated. Hi, I see Watergate St was King St. I'm looking for Victory St which was near King St in 1891 census. Is there a online street map of this time i could look at. The only Victory Street I know is the one off King Street just south of the Broadway..... not the one at the north end of Deptford.... Old King St/Watergate St etc. Here's a link for a map which shows its location. Hi am trying to research Sidney James born in watergate street 1905 - lived at number 142 any info would be amazing. I lived on the street where I was born , Grinstead Road in one of the prefabs , until I was 3 then we moved to St. Pauls Cray. My paternal grandmother lived on Grove St. and I still remember the steam engine trundling its way down to the Thames.I went to Infants school 1st at Evelyn St. and then Trundleys Rd.Before moving to Kent I spent some time in King Alfeges hospital 1st with claws toes and then I had my tonsils out. Some of happiest days of my life were spent playing in the park. I meant to add that I would be grateful if any of you good people had any information re my fathers family as I have no information about him. His name was Reginald Charles McDonnell and he once told that he had served in North Africa in the 2nd World War and that his father had died in the trenches in the 1st World War. Hello, my family were originally from Deptford. They had a hatters shop. Our family name is Borthwick. My great great grandfather married a lady with the surname Flood, and wondered if they are a family common to the area? I noticed there is a Borthwick street in Deptford. I am trying to research our family history. If anyone has any information or can help main any way could you please email dunkyb81@icloud.com. Hi all, my Dads (Terry King) family all come Deptford. his parents were Reg King and Kit (Catherine nee Causton). The had a stall on Douglas street selling second hand goods and clothes for many years. They lived at Frankham house and also travis house. Regs parents were Ernest (also known as Edgar) King and Daily Mary (nee Goldsmith). They lived a Releigh buildings and later 86 Speedwell house. Ernest was a sign writer in later years. My Dad went to Tidemill and and Stanley street school. Reg went to Hugues (users) field school. My dad remembers Perdie the tramp, with his long beard and that one day he was taken in to be deloused. Also going to the 'flea pit' cinema and having pie and mash at Goddards. Also the two old Italian women who used to sell ice cream in the high street. They used to fill the bucket up with In one of the sheds around the back from the market where my grandparents used to store their stall stuff. My Dad remembers the Nichols family. the father was called Raymond and Mother Julie. Reg used to drive people down to Kent to go hop picking in the back of his van. Aldbury (Union St) St has confused me until I read a posting, thank you. My 3rd x grandfather worked for the Admiralty. His name was David Appleton (1793 - 1830) I don't know if he ever went to sea but he later worked for the Navy as a clerk at Somerset House, and in Devonport where he came from. He married Mary Ann Munyard (daughter of Daniel M) and the brought up a family in Deptford. My 2nd x grandfather was a doctor so, since David is called 'gent' in some census's it has to be assumed they lived well enough to educate and fund their children's careers. If any one knows of these 2 names could they please please contact me? I am going grey trying to track him down - his father was alson amed David and he was a gunner on HMS Southampton at the time of his marriage to MaryGrigg - I believe they also moved to London at some point. My grandfather was Alfred STEAD. In 1911 his widowed mother and tree brothers were living at 65 Rolt Street, Deptford, and he was in Australia. By December 1914, the family was living at 47 Shene Road, which no longer exists, thanks to the Goring Demolition Company's Blitz renovations in the 1940s. In 1911, his elder two brothers were coppersmiths, working at a tank works. They were following their father's trade. He died in 1908. At the time, my grandfather was 17 and his occupation was listed as a labourer. When he came to Australia, he still gave his occupation as labourer, but he was living with a family in the butchering trade. I guess while in Deptford, he worked in Butchers Row. I'm writing a histo-fiction based on his early life up until 1920, which I hope to have published by 25 April 2015, the 100th anniversary of the start of the Dardanelles campaign, and the beginning of the ANZAC tradition. I know the Walter lived into the mid-20th Century at Kidbrooke, Kent. I have yet to discover what happened to Willie and Louie, but I fear that they did not survive WWl. Hi, you might be interested in this site if it isn't already mentioned here. I couldn't see it so don't think it is. I am researching my grandmother Rebecca Smith her family ran the grocers shop at 17 Hyde St. Deptford. She married James Andrews in 1911. I know the shop has since been demolished but I was wondering if there are any photo's of shops in that street. The Smith family owned the shop and my mother ran it up to 1911. There was a photo of the shop in the family but it seems to have disappeared. I know it's a long shot but fingers crossed. I'm researching my family who are the Say and the Savill family who lived on Watergate Street between 1870 and up to the 1940s (the Say family were there ages before that). I'm also particularly interested in Charlotte Say (nee Manners) who died in 1939 aged 90 and an accident that occurred on 3/10/28 where a 10 year old John Say was run over and killed in Wellington Street, outside the United Friends Pub (known as the Madhouse). Any help gratefully received. My great-grandparents, John and Ethel Mitchell, lived at 156 Watergate in 1911. They are living at that address at the time of the census. By the end of 193 they had emigrated to Australia, settling in Melbourne. Great to see pictures of the area my Bowdidge ancestors lived at 30 Old King Street, (later renamed Watergate Street) Deptford, on census from 1841 to John Bowdidge's death in 1879. He was a carpenter, I think involved in chandlery for shipping. I'm trying to find out my husband's family. J Rolls and Sons they were sail makers. I think there factory was on Old Kent Road.